(Nanowerk Spotlight) For the builders and engineers among you, our subject today is cement. Not necessarily a material one would associate with high-tech, not to mention nanotechnology. However, it's probably fair to say that our modern society is built on cement. Look around you and you'll find it everywhere - in buildings, roads, bridges, dams. Early construction cement (the word goes back to the Romans who used the term opus caementitium to describe masonry which resembled concrete and was made from crushed rock with burnt lime as binder) probably is as old as construction itself. So what is it? Cement, as it is commonly known, is a mixture of compounds made by burning limestone and clay together at very high temperatures. Cement is then used, together with water, as binder in a synthetic composite material known as concrete. For concrete to obtain its optimal properties it needs to harden. And that takes time. For builders, time is money and particularly in industrial settings time is a major cost issue. Time is also a safety and convenience factor, think about infrastructure repair work on roads and dams for instance. Cement manufacturers have already known that reducing the particle size of cements results in faster-binding formulations. By taking the ultimate reduction down to the nanoscale, researchers in Switzerland have shown that a one-step preparation of nanoparticulate cement with a conventional Portland cement composition results in a drastically increased early reactivity of the cement. Cement hardening (concrete does not need to dry out in order to harden as commonly thought) is a surface-depending process where a reactive starting phase subsequently reacts with water and recrystallizes. Therefore, the time it takes for sample to achieve a given hardness, is related to the amount of surface of the starting material. If you think about using a large, solid piece of cement, e.g. a 1 inch block, it would take months for water to slowly enter the block and react it. If you make the material smaller, the ratio of surface to volume is more beneficial, hence, the reaction is faster. Now, this has been known for over a century. And, people have thought about making really small powders, best would obviously be a nanometer-sized powder. "Since cements are water sensitive you can not access them by classical nanomaterials synthesis methods working by precipitation or sol-gel wet-phase chemistry" Dr. Wendelin Stark explains to Nanowerk, "We have therefore developed a dry, gas-phase process which resulted in a novel and direct, one-step preparation of calcium silicate-based nanoparticles of a typical Portland cement (the most common type of cement) composition by flame spray synthesis. Isothermal calorimetry revealed that the hardening of this new nano-cement corroborated a more than tenfold increase of initial reactivity with different reaction kinetics if compared to conventionally prepared cements." As a caveat, Stark, an Assistant Professor of Catalysis at the Institute for Chemical and Bioengineering of the ETH Zürich, emphasizes that at present, the nano-cement is very porous and less stable than currently used materials. It will need additional improvements of chemical composition and formulation to make these highly reactive materials applicable to modern construction work, where load-bearing strength is of importance. As as starting point, Stark and his team took a widely used flame aerosol process process (with outputs of over 10 million tons per year) applied in pigment and carbon black manufacturing. "In order to process complex compositions such as Portland cement, we had to work quite a bit of chemistry, but we managed to find very low cost precursors relying on a by-product from crude oil refining" says Stark. "This cost-effective method now allowed us to prepare nano-cements with a classical Portland cement composition." Interesting for future commercial applications, the process similarity with existing large scale production methods facilitates scale-up and transfer to industrial scale manufacturing and potentially enables the implementation of such highly reactive nanoparticles on an application scale. Conventionally manufactured Portland cement consists of irregularly shaped, micron-sized particles of a broad particle size distribution ranging from a few to over 60 µm, In contrast, the nano-cement showed nanoparticle of various sizes, depending on the temperature of the treatment. 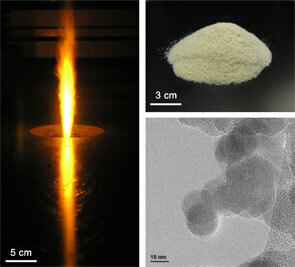 On average, the flame-made nanoparticles were up to three orders of magnitude smaller than the conventionally prepared counterparts. 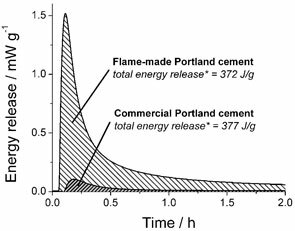 The small size of the particles changed the hydration behavior of the cement completely and suggests different reaction kinetics while maintaining similar reaction thermodynamics. The reduction in particle size resulted in a drastically increased early reactivity of the cement. "We found that hardening is way faster, our materials are solid within a few minutes and reactions are over in less than an hour" says Stark. Notwithstanding the currently unfavorably high porosity of their material, Stark believes that the early reactivity of the nano-cement might open up entirely new fields of applications for Portland type cements, in particular where short hardening times are crucial. "In its present form, the nanoparticle-derived, porous cement could be used in renovation or insulation applications where compressive strength is less critical or might enhance the hardening behavior of conventional cements if deployed as an admixture" he says. "Further improvements in terms of hardness, however, will be necessary before such materials can be used in load-bearing applications." At present, the cement is being explored for a series of very costly small scale application. Particularly, building joints or admixing to existing formulations for speeding them up, is attractive. A paper on this research appeared recently in Nanotechnology ("Preparation of an ultra fast binding cement from calcium silicate-based mixed oxide nanoparticles").